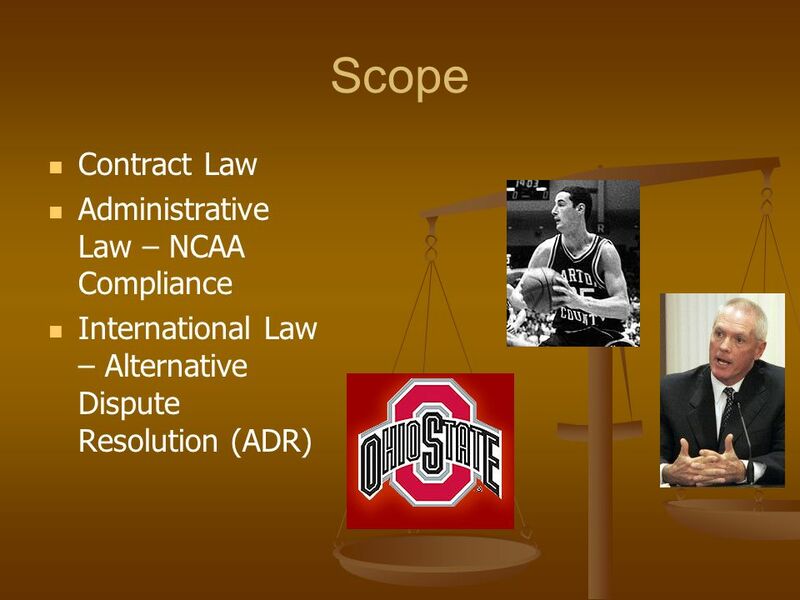 Integrating Fields in Sport Law: Using the O'Brien v Ohio State University Case To Teach Principles of Contract Law, NCAA Compliance, and International. 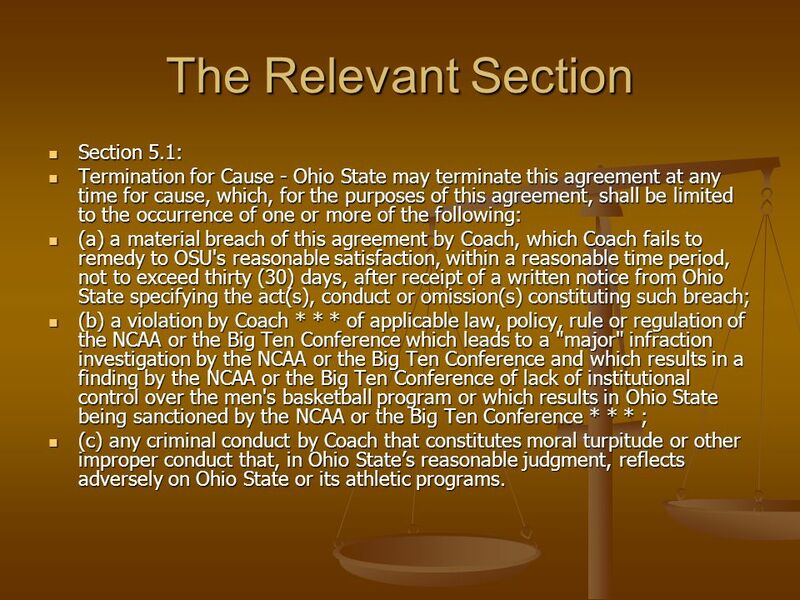 Termination for Cause - Ohio State may terminate this agreement at any time for cause, which, for the purposes of this agreement, shall be limited to the occurrence of one or more of the following: (a) a material breach of this agreement by Coach, which Coach fails to remedy to OSU's reasonable satisfaction, within a reasonable time period, not to exceed thirty (30) days, after receipt of a written notice from Ohio State specifying the act(s), conduct or omission(s) constituting such breach; (b) a violation by Coach * * * of applicable law, policy, rule or regulation of the NCAA or the Big Ten Conference which leads to a "major" infraction investigation by the NCAA or the Big Ten Conference and which results in a finding by the NCAA or the Big Ten Conference of lack of institutional control over the men's basketball program or which results in Ohio State being sanctioned by the NCAA or the Big Ten Conference * * * ; (c) any criminal conduct by Coach that constitutes moral turpitude or other improper conduct that, in Ohio State’s reasonable judgment, reflects adversely on Ohio State or its athletic programs. 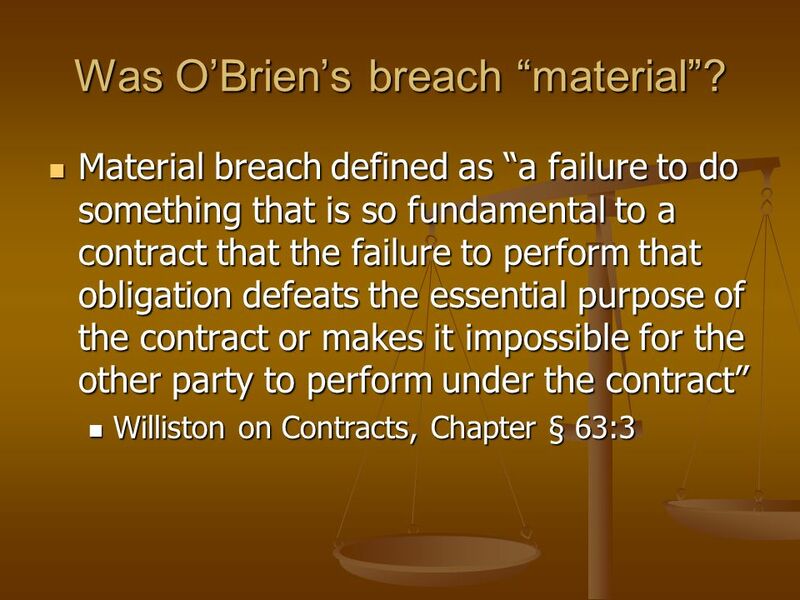 13 Was O’Brien’s breach “material”? Restatement of the Law 2d, Contracts, § 241. 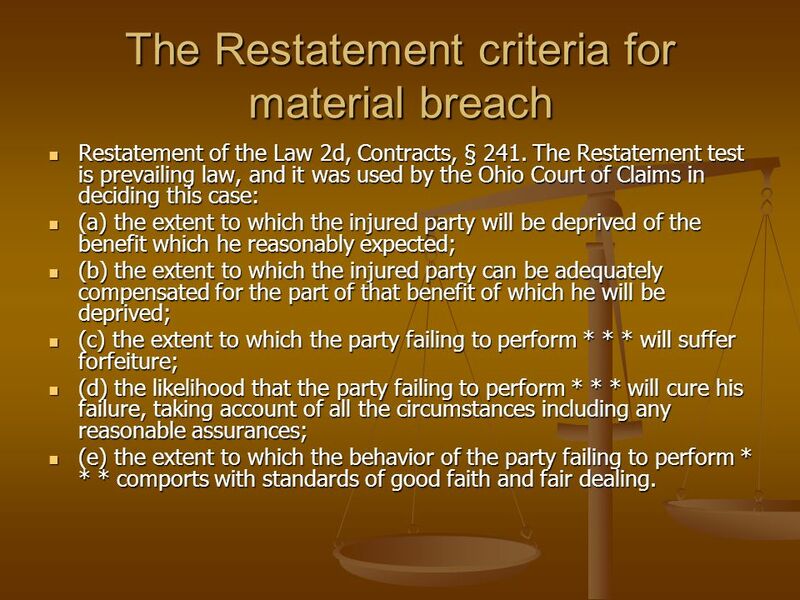 The Restatement test is prevailing law, and it was used by the Ohio Court of Claims in deciding this case: (a) the extent to which the injured party will be deprived of the benefit which he reasonably expected; (b) the extent to which the injured party can be adequately compensated for the part of that benefit of which he will be deprived; (c) the extent to which the party failing to perform * * * will suffer forfeiture; (d) the likelihood that the party failing to perform * * * will cure his failure, taking account of all the circumstances including any reasonable assurances; (e) the extent to which the behavior of the party failing to perform * * * comports with standards of good faith and fair dealing. 1. 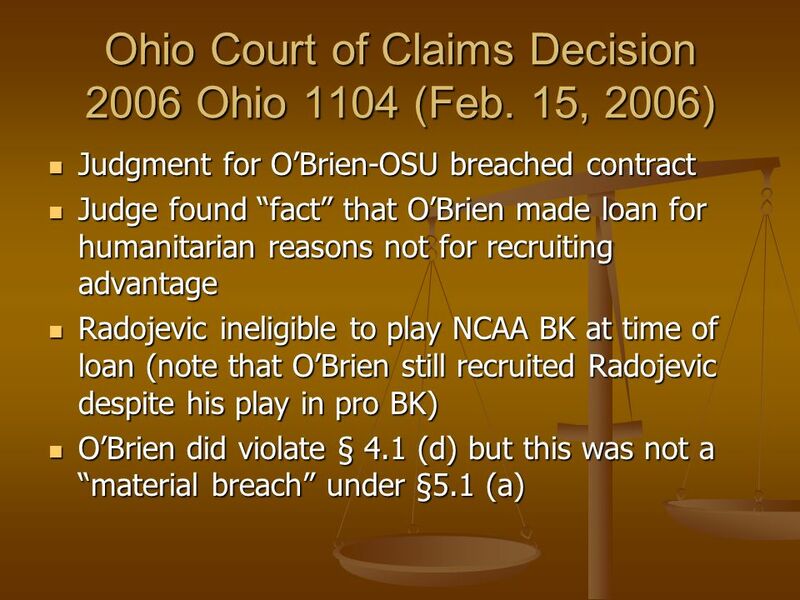 The judge in this case interpreted the facts in favor of O’Brien when he characterized the loan as for humanitarian reasons and not to gain an improper recruiting advantage. What facts might support a more sinister interpretation of the coach’s conduct? 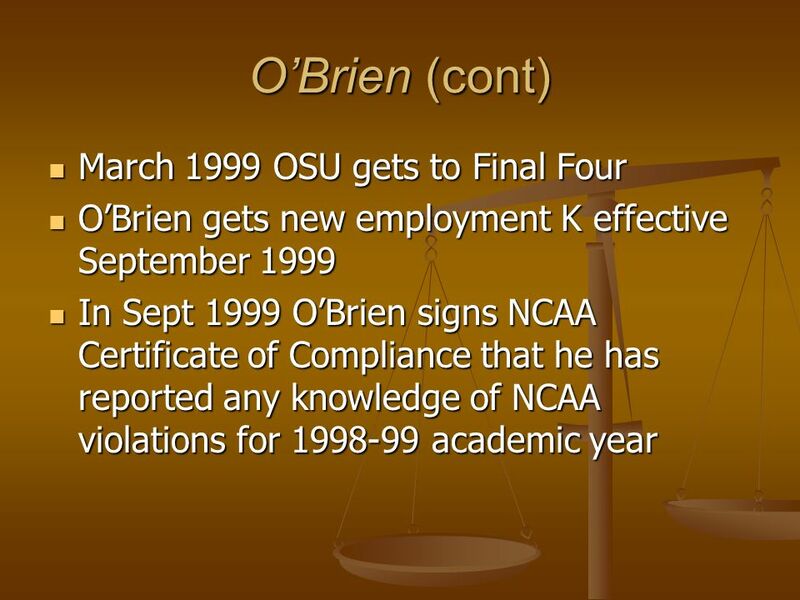 Discussion Point: O’Brien’s “story” was inconsistent. 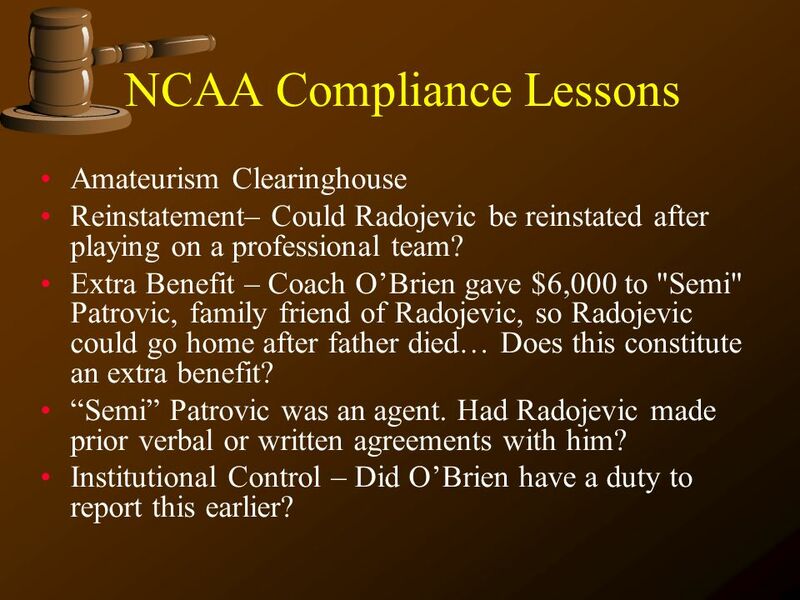 If he really felt that Radojevic was ineligible to play college basketball, why did he have Radojevic sign a NLI and come for an official visit? 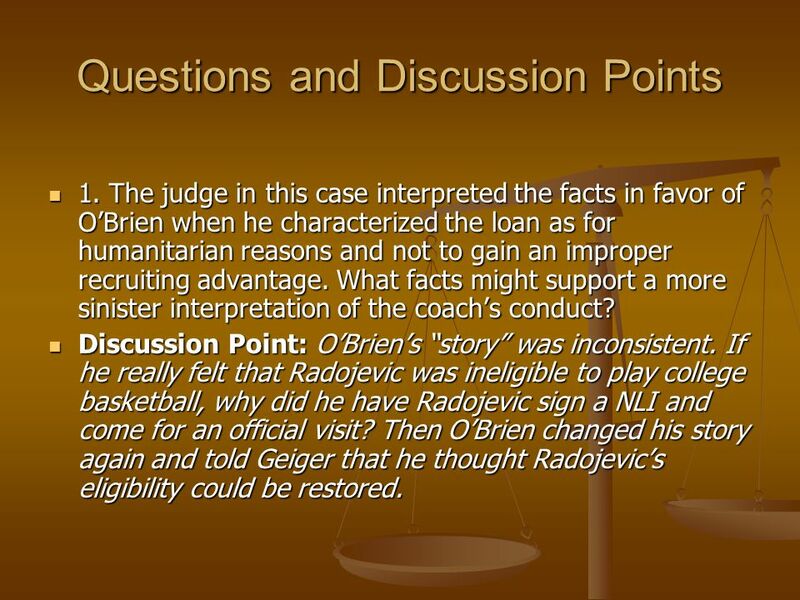 Then O’Brien changed his story again and told Geiger that he thought Radojevic’s eligibility could be restored. 2. 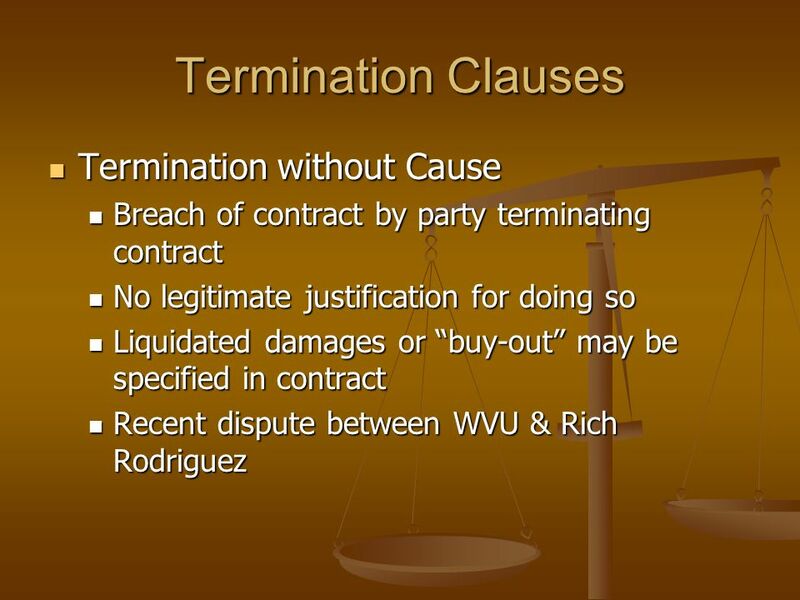 Discuss how Ohio State could have strengthened its grounds for termination for cause. 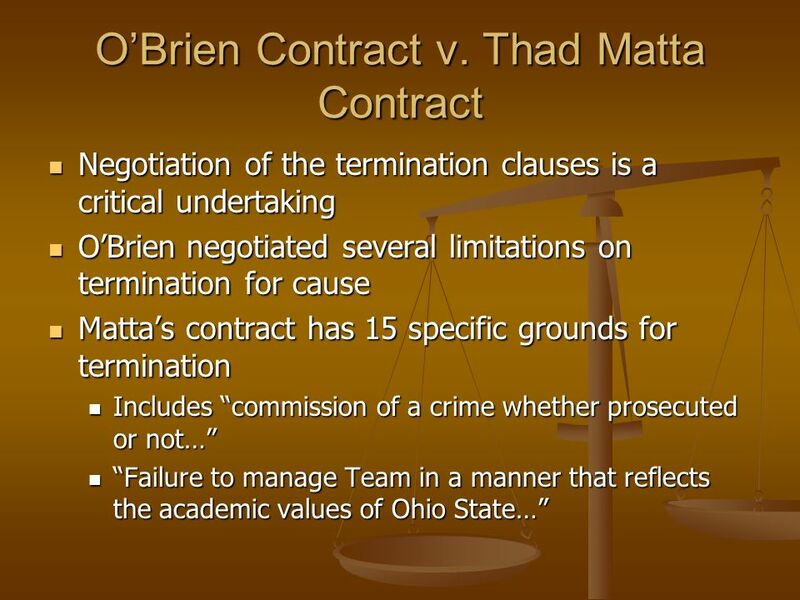 Discussion Points: When Ohio State negotiated the employment agreement with O’Brien it could have drafted language that provided that any failure to immediately report any violation of NCAA or Big Ten rules is a material breach of the contract. In that way, it would not be up to a fact finder to decide, as here, that a single failure to report was not a material breach. 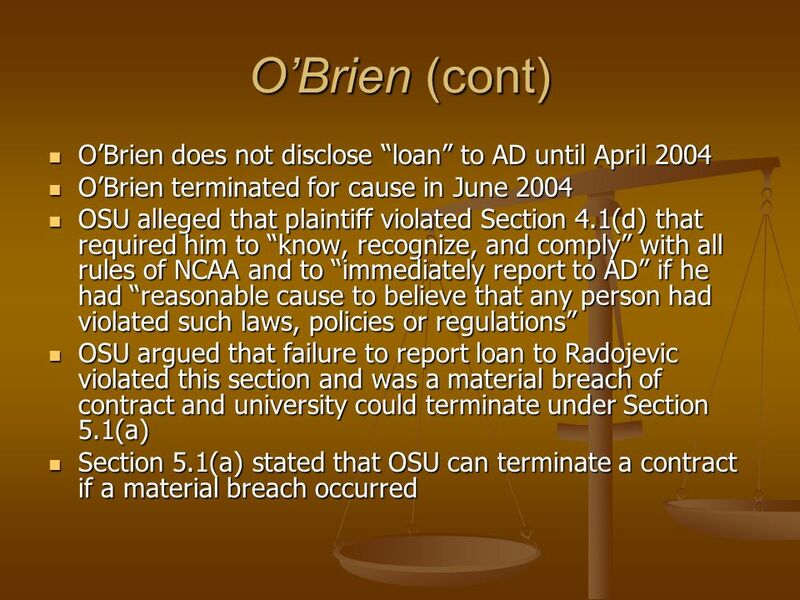 OSU negotiated a termination clause very favorable to O’Brien and it paid the price here. 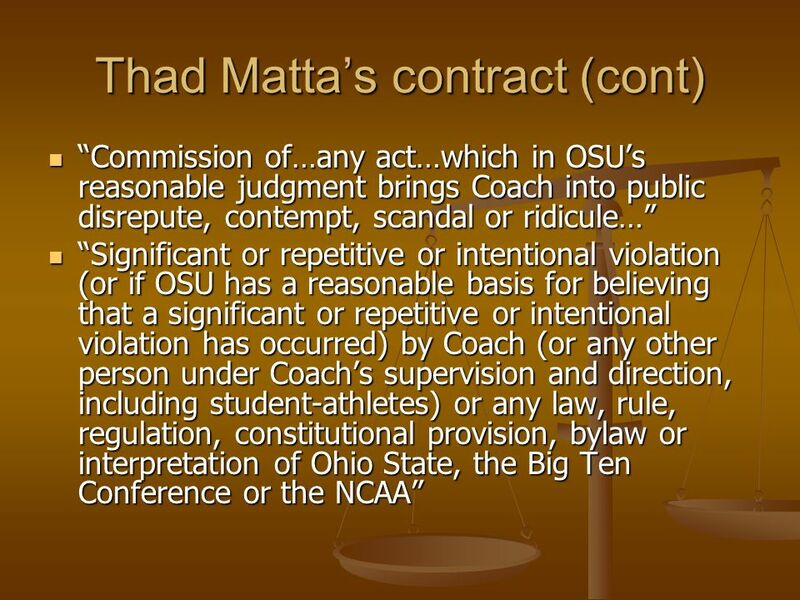 A review of successor Thad Matta’s contract shows the degree to which a lengthy list of behaviors could all be grounds for termination Ohio State could also have waited to see if the Radojevic incident would be investigated by the NCAA as a major infraction. 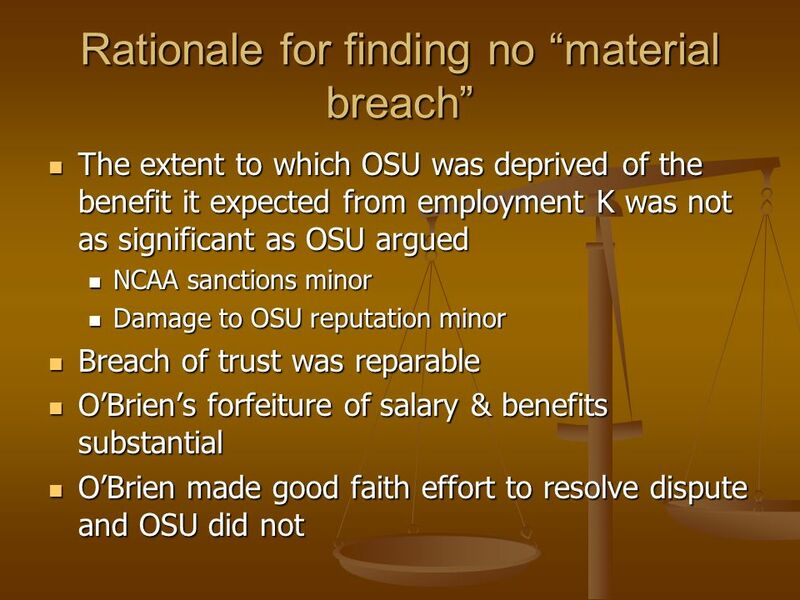 But in this case the NCAA did not investigate for another 11 months after O’Brien was terminated, so relying on this clause would have meant that Ohio State would not have been able to terminate O’Brien at the earlier date, when there was a need to do so based on public concern about the program. 3. 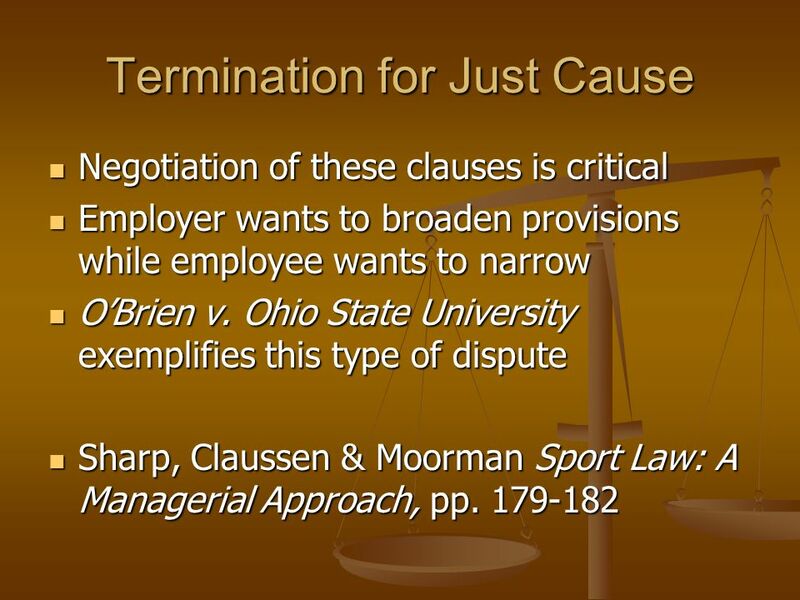 Discuss the implications of this decision relative to other colleges that may wish to terminate coaches “for cause.” Discussion Point: This ruling may deter schools from trying to use the “for cause” provisions in coaches’ contracts. 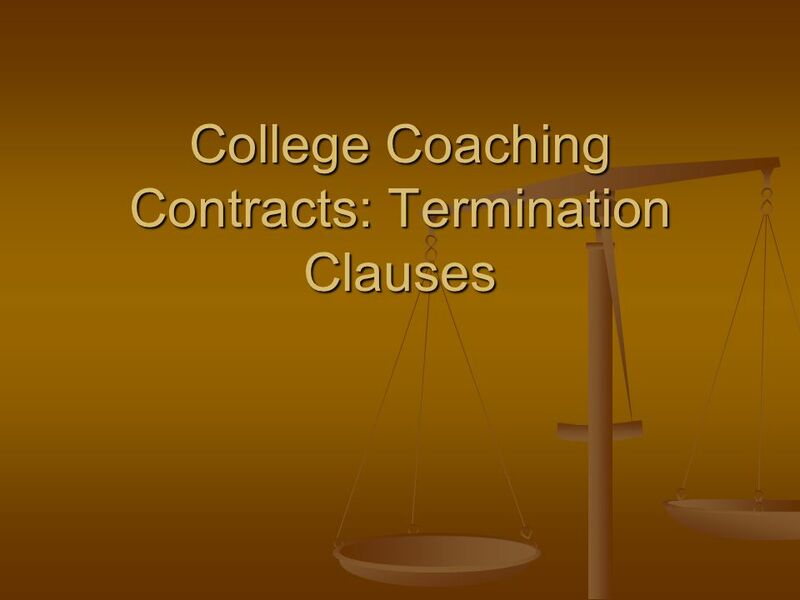 Often schools have chosen to take the easy way out in these types of situations by terminating the contract without cause and paying a buy-out to a coach instead of risking litigation by the coach who has been terminated for cause. 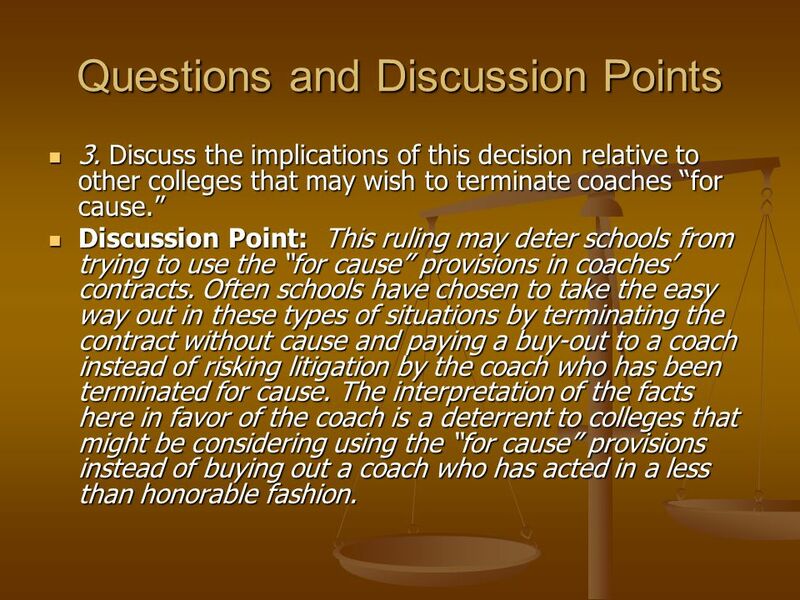 The interpretation of the facts here in favor of the coach is a deterrent to colleges that might be considering using the “for cause” provisions instead of buying out a coach who has acted in a less than honorable fashion. 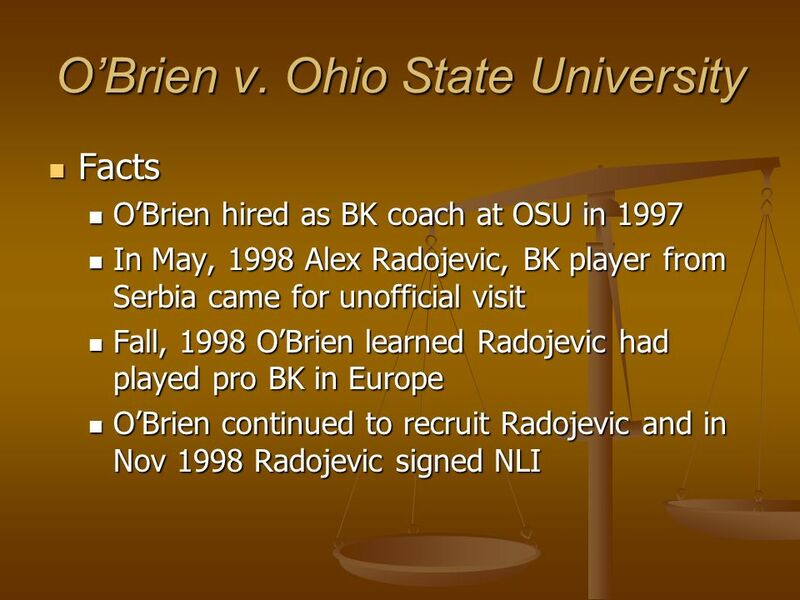 O’Brien v. Ohio State Univ., 2006 Ohio 1104 (Ct. Claims Feb. 15, 2006) O’Brien v. Ohio State Univ., 2007 Ohio App. LEXIS 4316 (Ct. App. 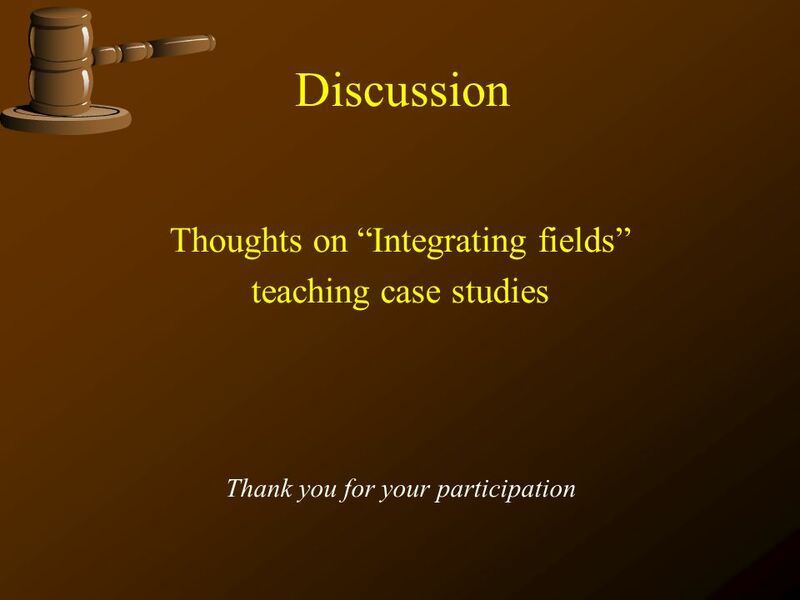 Sept. 20, 2007) Greenberg, M.J.(2006). 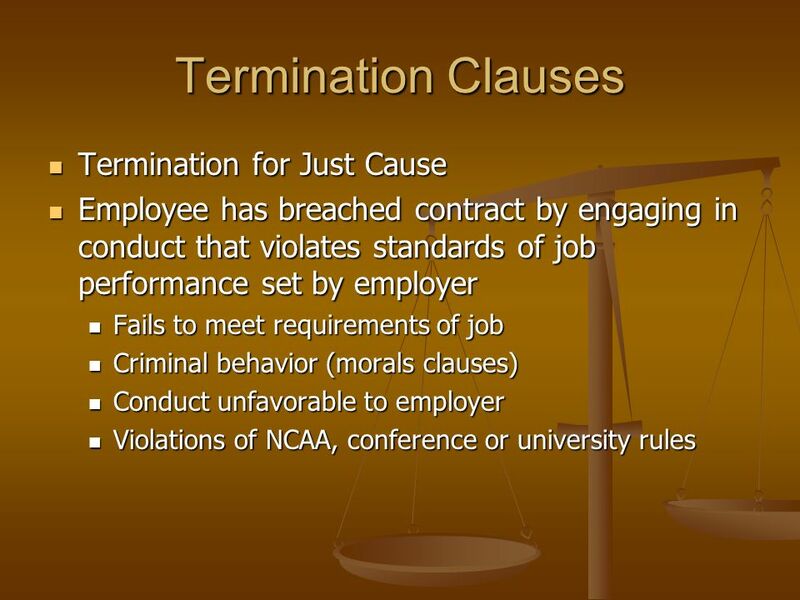 Termination of college coaching contracts…17 Marquette Sports Law Rev. 197. 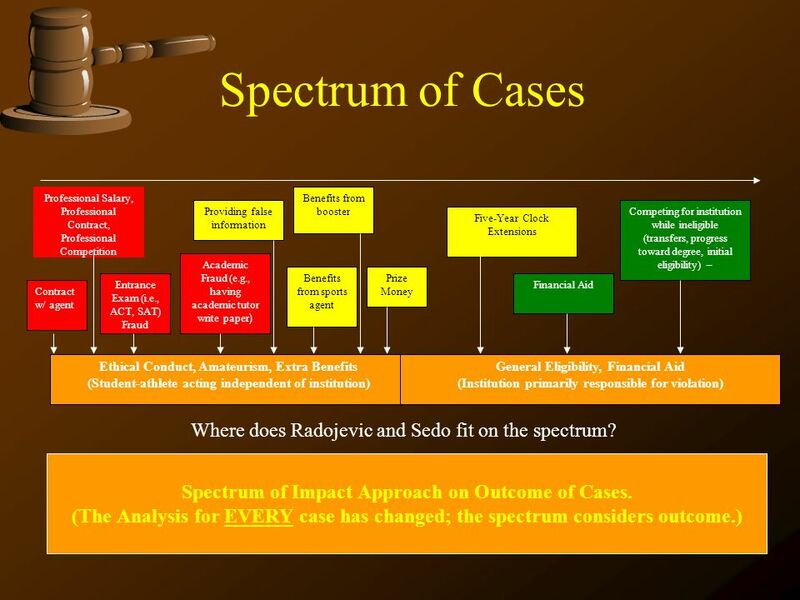 28 Spectrum of Cases Where does Radojevic and Sedo fit on the spectrum? 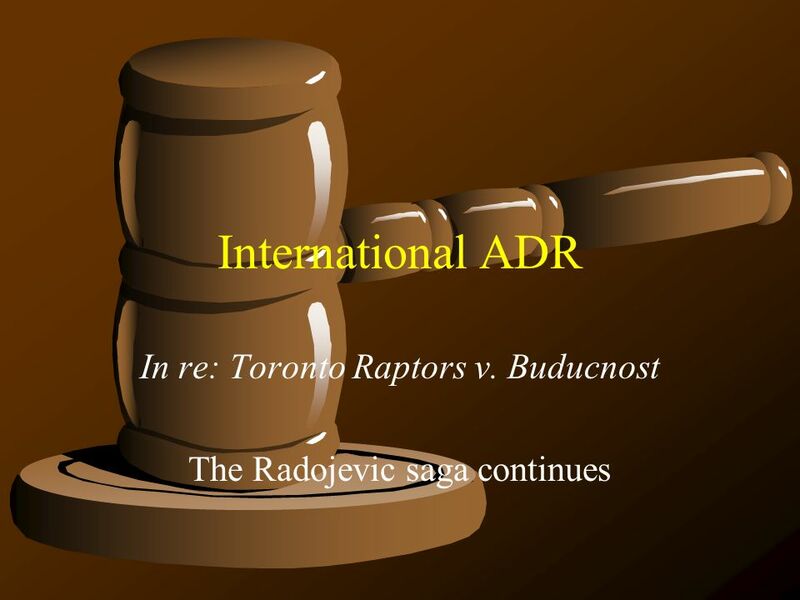 Amateurism Clearinghouse Reinstatement– Could Radojevic be reinstated after playing on a professional team? 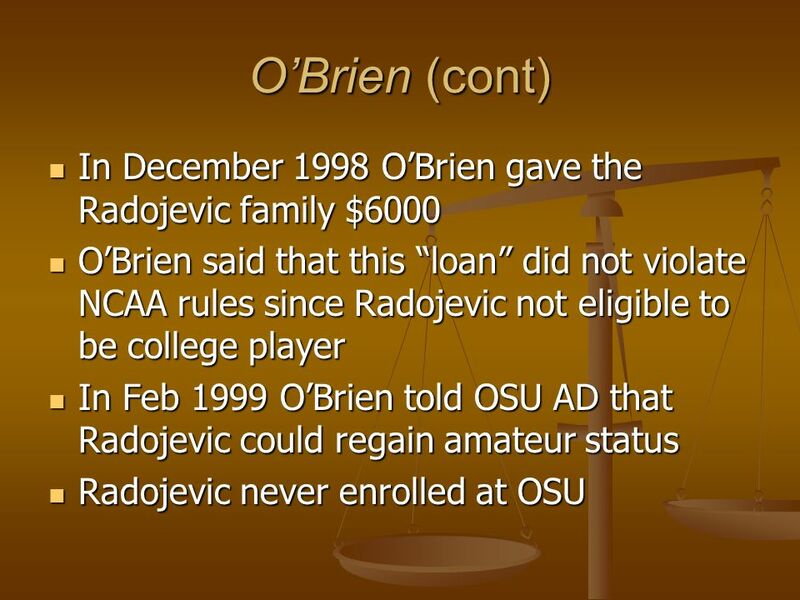 Extra Benefit – Coach O’Brien gave $6,000 to "Semi" Patrovic, family friend of Radojevic, so Radojevic could go home after father died… Does this constitute an extra benefit? “Semi” Patrovic was an agent. 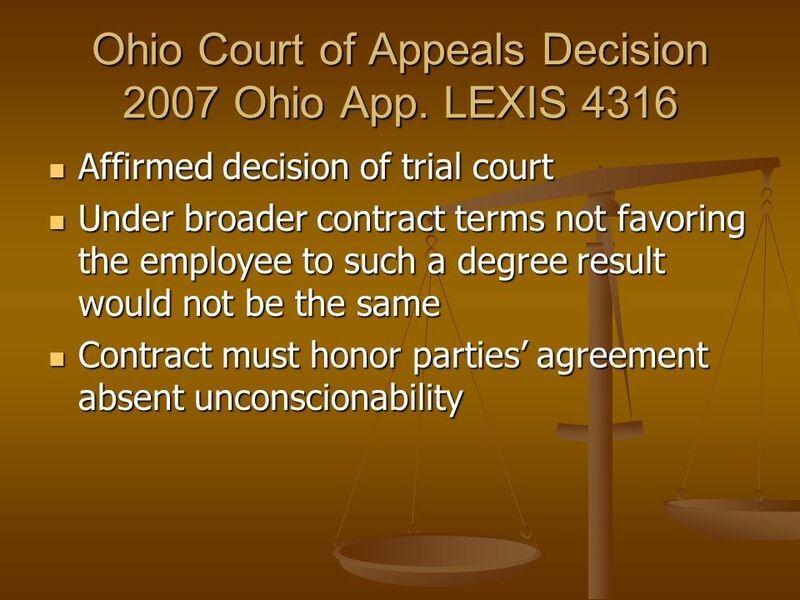 Had Radojevic made prior verbal or written agreements with him? Institutional Control – Did O’Brien have a duty to report this earlier? 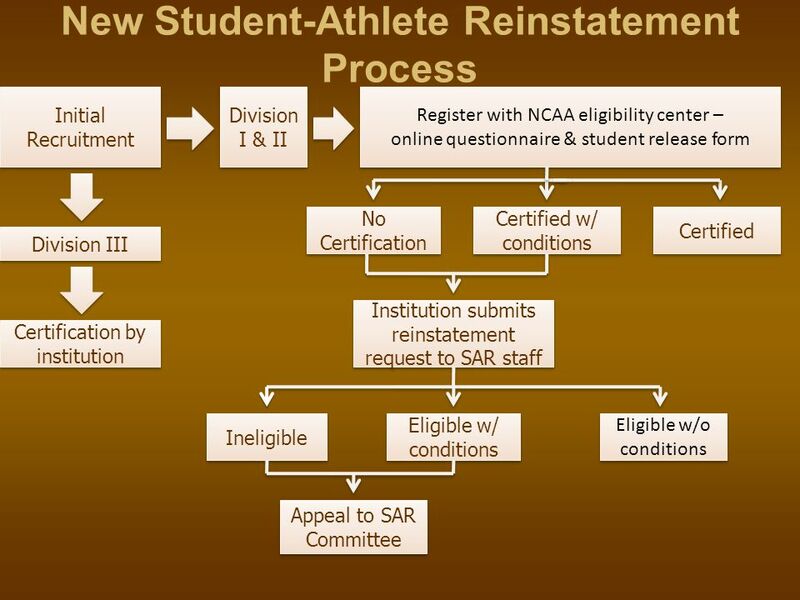 Student-athlete reinstatement is a department within the NCAA's membership services program. 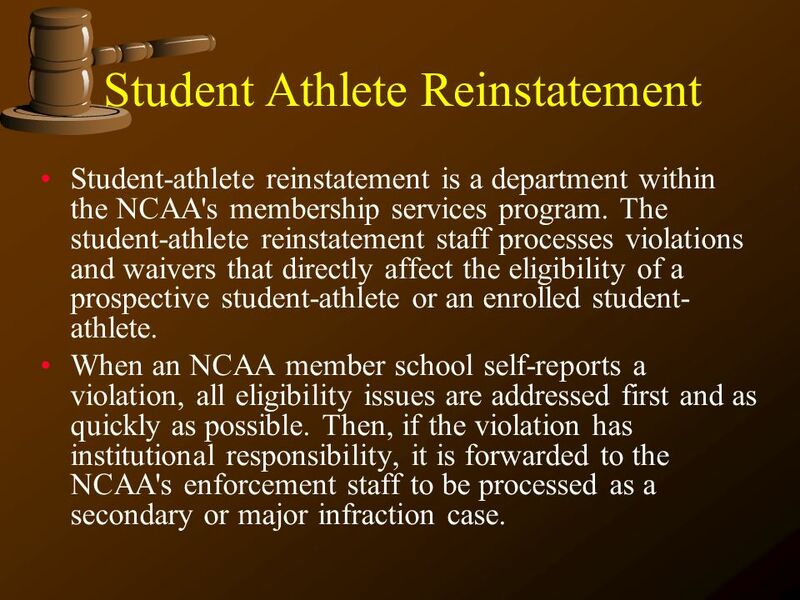 The student-athlete reinstatement staff processes violations and waivers that directly affect the eligibility of a prospective student-athlete or an enrolled student-athlete. When an NCAA member school self-reports a violation, all eligibility issues are addressed first and as quickly as possible. 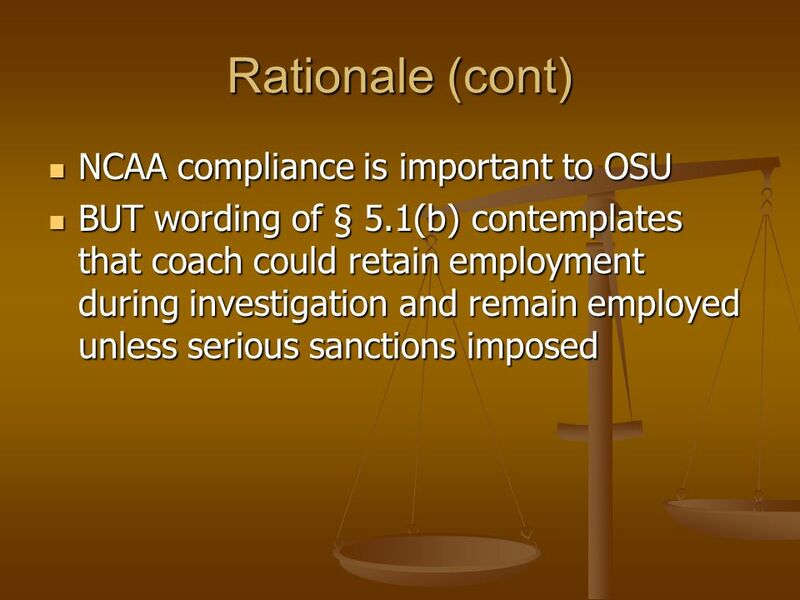 Then, if the violation has institutional responsibility, it is forwarded to the NCAA's enforcement staff to be processed as a secondary or major infraction case. 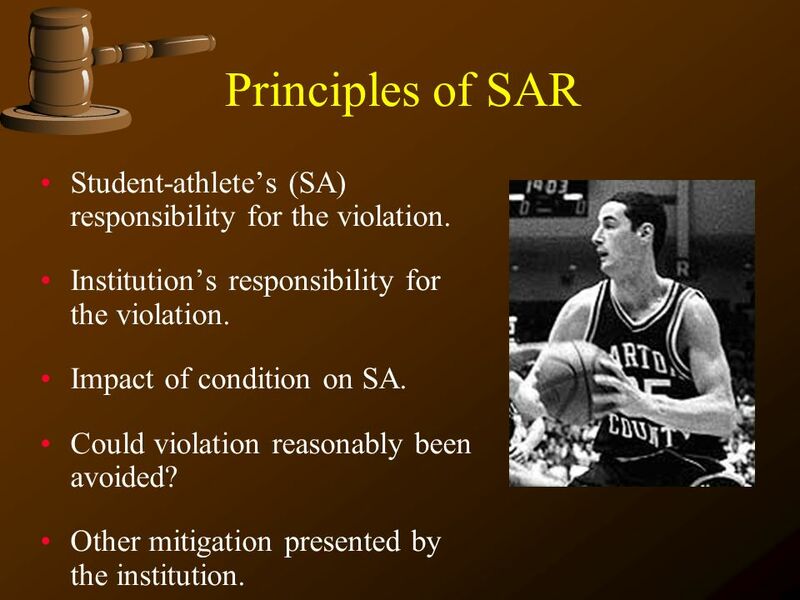 31 Principles of SAR Student-athlete’s (SA) responsibility for the violation. Institution’s responsibility for the violation. Impact of condition on SA. Could violation reasonably been avoided? Other mitigation presented by the institution. 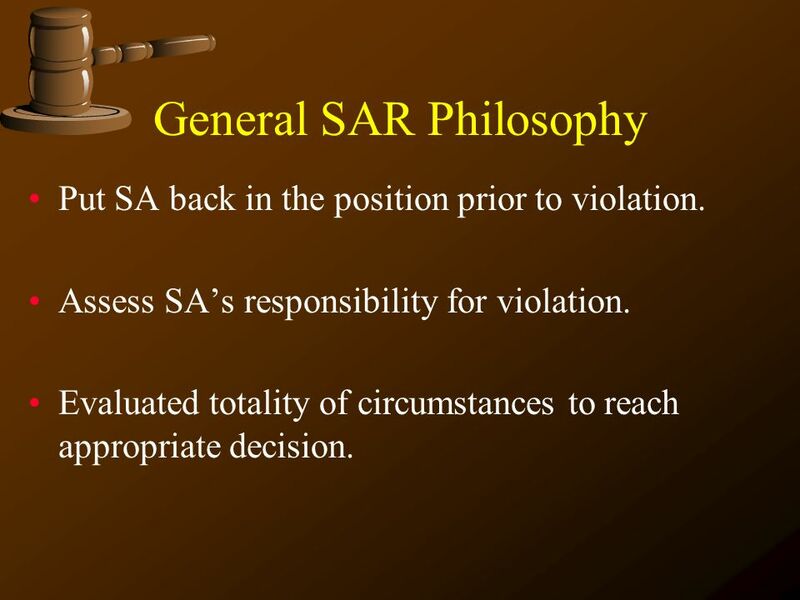 Put SA back in the position prior to violation. Assess SA’s responsibility for violation. 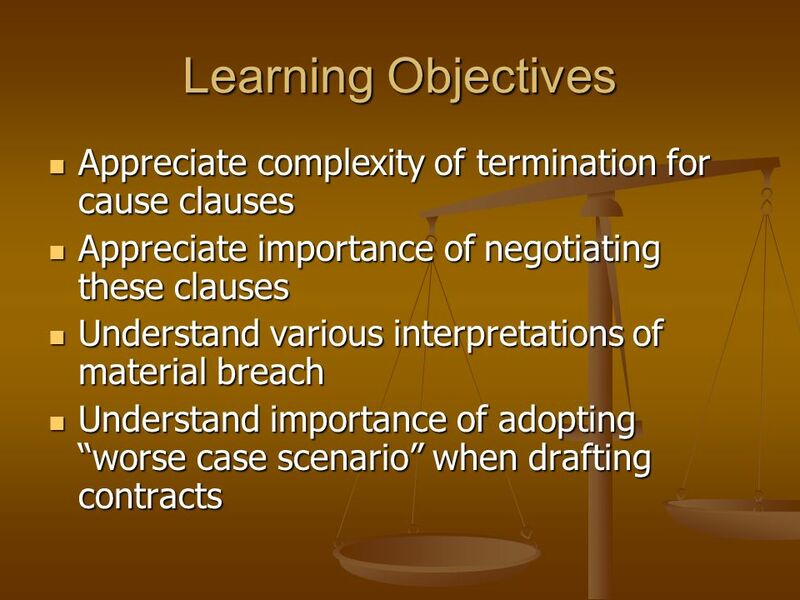 Evaluated totality of circumstances to reach appropriate decision. 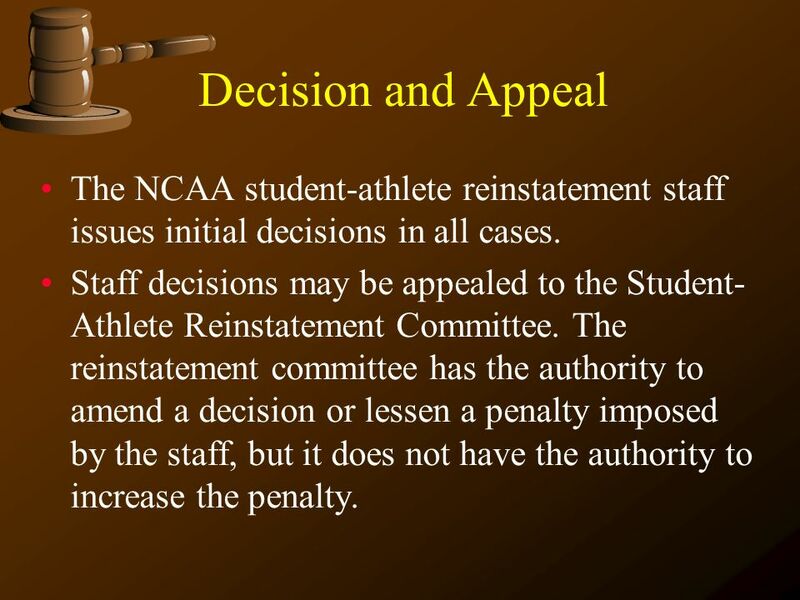 36 Decision and Appeal The NCAA student-athlete reinstatement staff issues initial decisions in all cases. 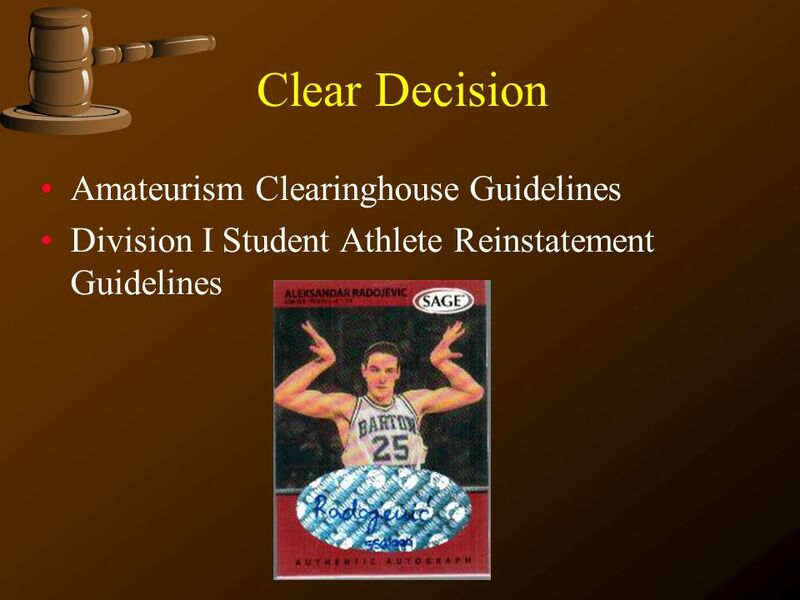 Staff decisions may be appealed to the Student-Athlete Reinstatement Committee. The reinstatement committee has the authority to amend a decision or lessen a penalty imposed by the staff, but it does not have the authority to increase the penalty. 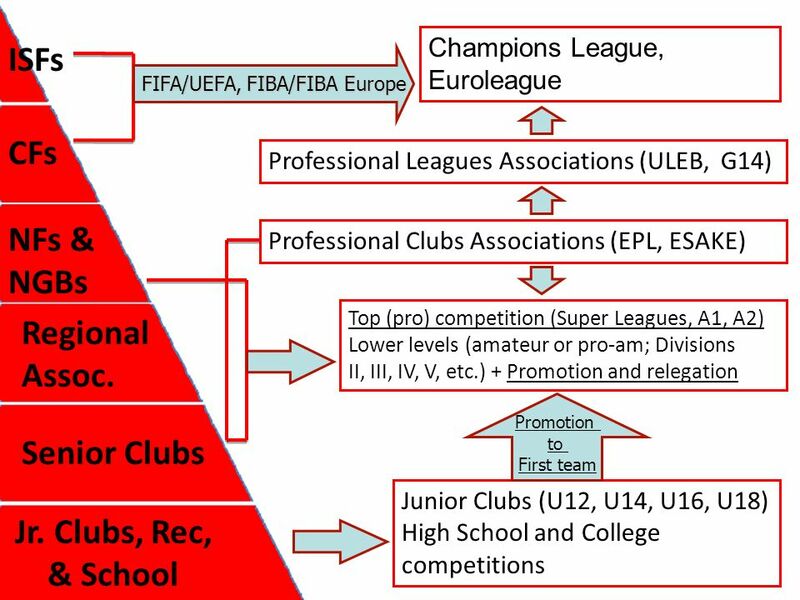 Contract with a professional team. Salary for participating in athletics. Prize money. Play with professionals. Tryout, practice or competition with a professional team. Draft. Benefits from an agent or prospective agent. Agreement to be represented by an agent. 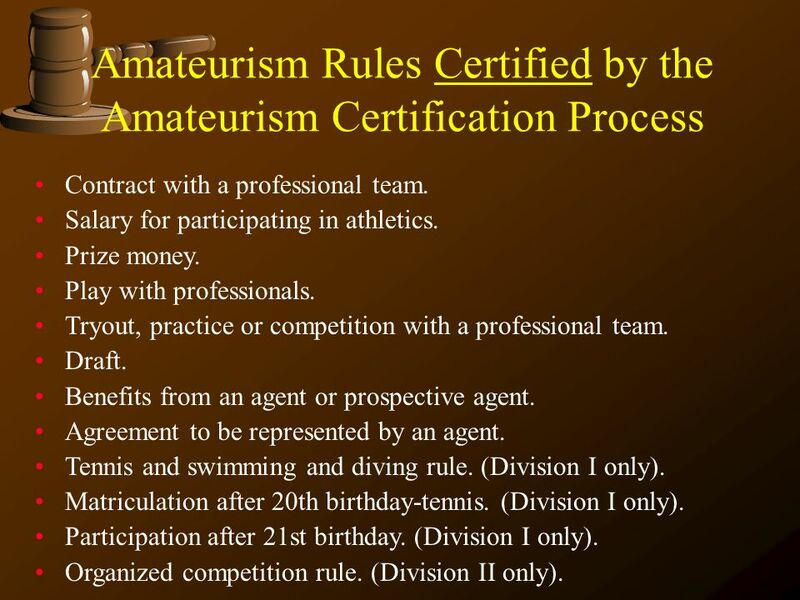 Tennis and swimming and diving rule. (Division I only). Matriculation after 20th birthday-tennis. (Division I only). Participation after 21st birthday. (Division I only). 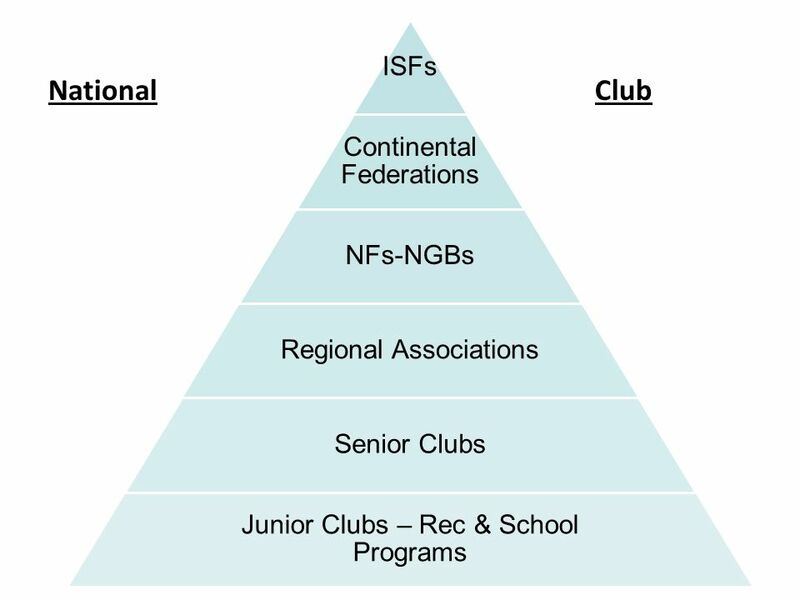 Organized competition rule. (Division II only). Creation of prescribed penalties to be imposed. 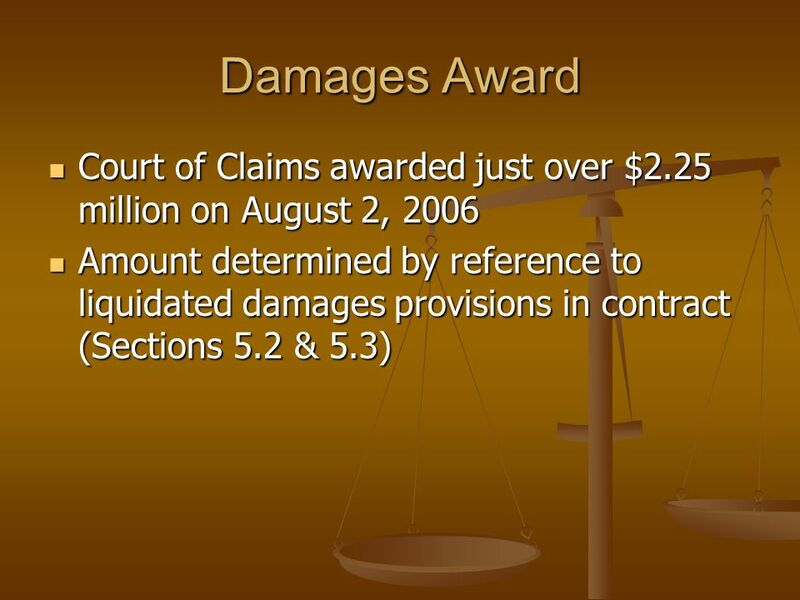 Cases not on prescribed list or where mitigation is present will be forwarded to reinstatement staff. Reinstatement staff will provide condition as part of certification process. 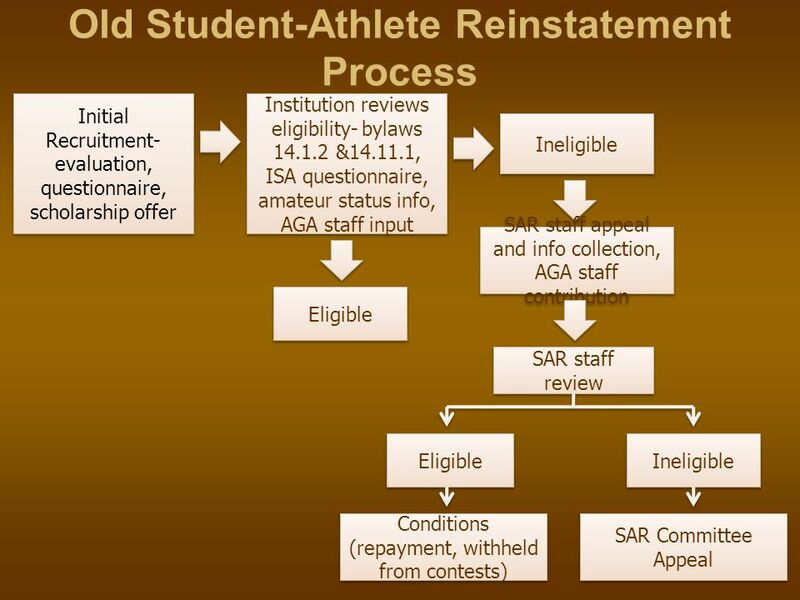 Decision can be appealed by an institution to the student-athlete reinstatement committee. 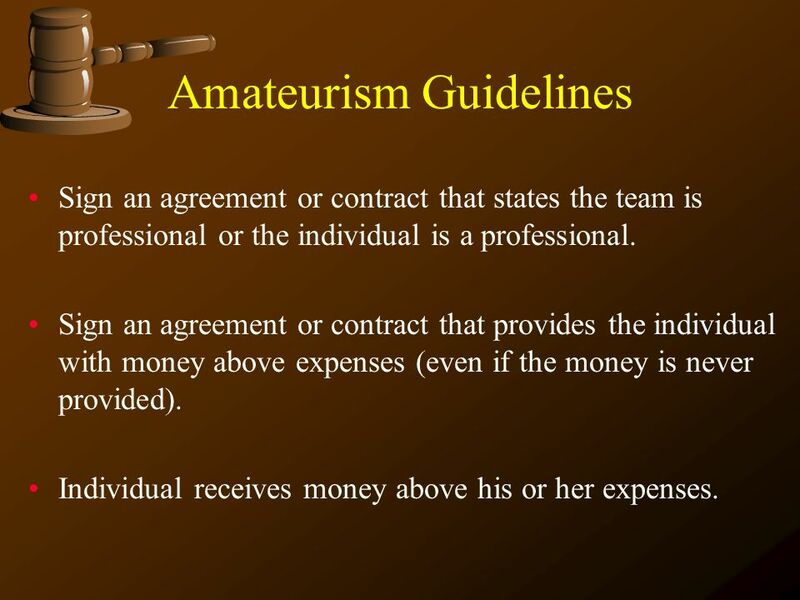 Sign an agreement or contract that states the team is professional or the individual is a professional. Sign an agreement or contract that provides the individual with money above expenses (even if the money is never provided). Individual receives money above his or her expenses. Individual has profited from his or her sport. Individual consistently represents himself or herself as a professional athlete. Individual enters into a written or verbal agreement with an agent. Individual accepts significant monetary benefits from an agent. 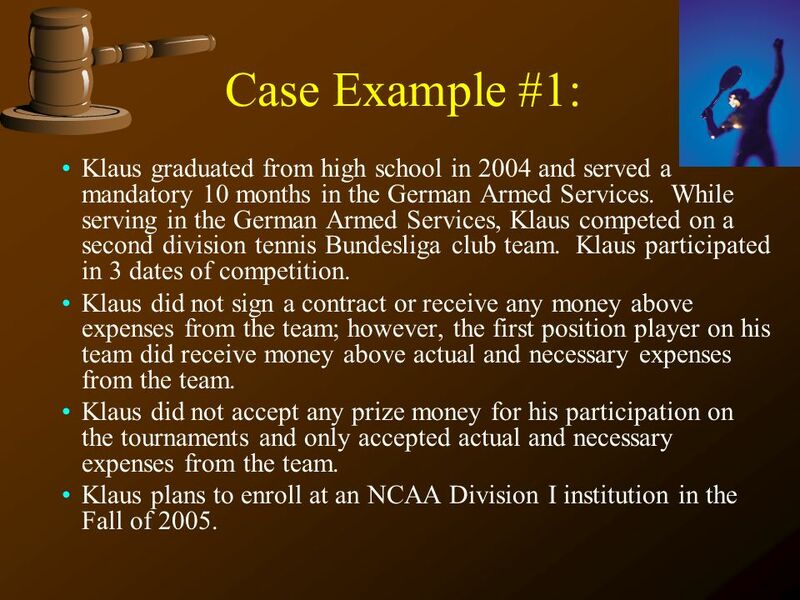 42 Case Example #1: Klaus graduated from high school in 2004 and served a mandatory 10 months in the German Armed Services. While serving in the German Armed Services, Klaus competed on a second division tennis Bundesliga club team. Klaus participated in 3 dates of competition. Klaus did not sign a contract or receive any money above expenses from the team; however, the first position player on his team did receive money above actual and necessary expenses from the team. Klaus did not accept any prize money for his participation on the tournaments and only accepted actual and necessary expenses from the team. Klaus plans to enroll at an NCAA Division I institution in the Fall of 2005. 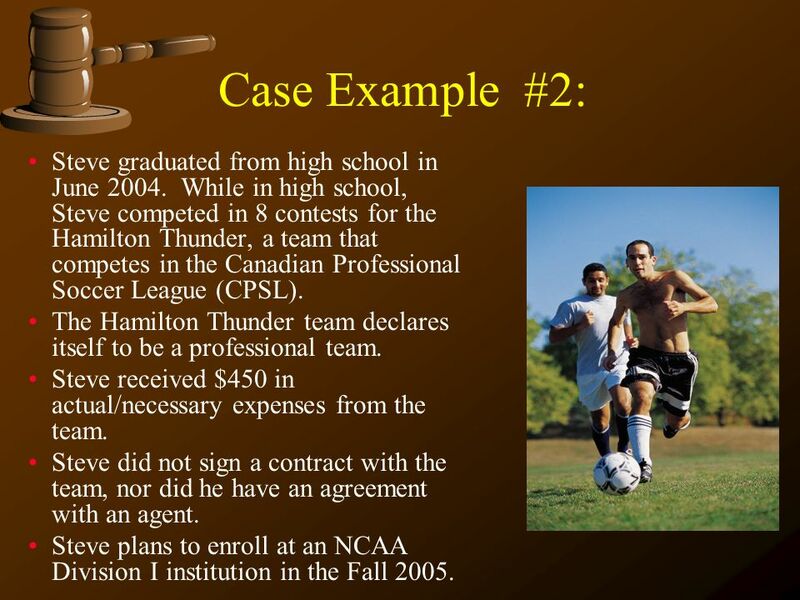 43 Case Example #2: Steve graduated from high school in June While in high school, Steve competed in 8 contests for the Hamilton Thunder, a team that competes in the Canadian Professional Soccer League (CPSL). The Hamilton Thunder team declares itself to be a professional team. Steve received $450 in actual/necessary expenses from the team. Steve did not sign a contract with the team, nor did he have an agreement with an agent. Steve plans to enroll at an NCAA Division I institution in the Fall 2005. 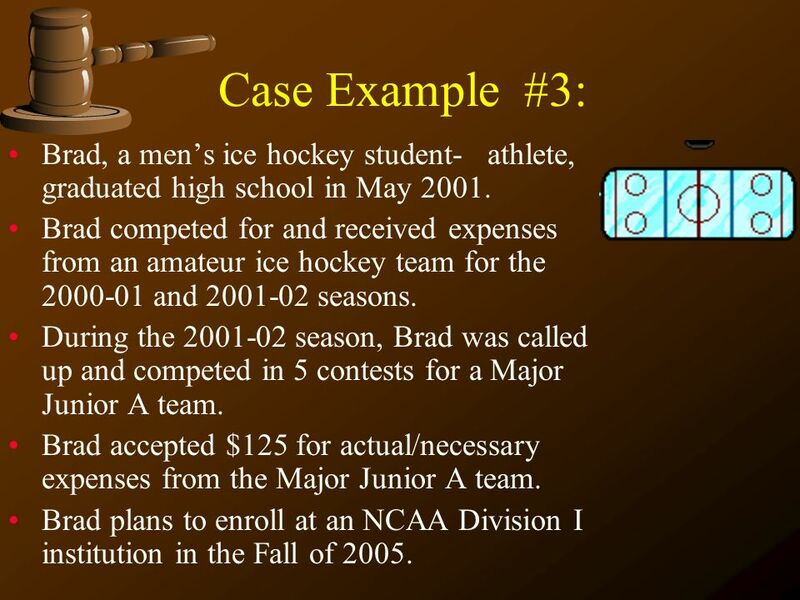 44 Case Example #3: Brad, a men’s ice hockey student- athlete, graduated high school in May 2001. Brad competed for and received expenses from an amateur ice hockey team for the and seasons. During the season, Brad was called up and competed in 5 contests for a Major Junior A team. Brad accepted $125 for actual/necessary expenses from the Major Junior A team. Brad plans to enroll at an NCAA Division I institution in the Fall of 2005. 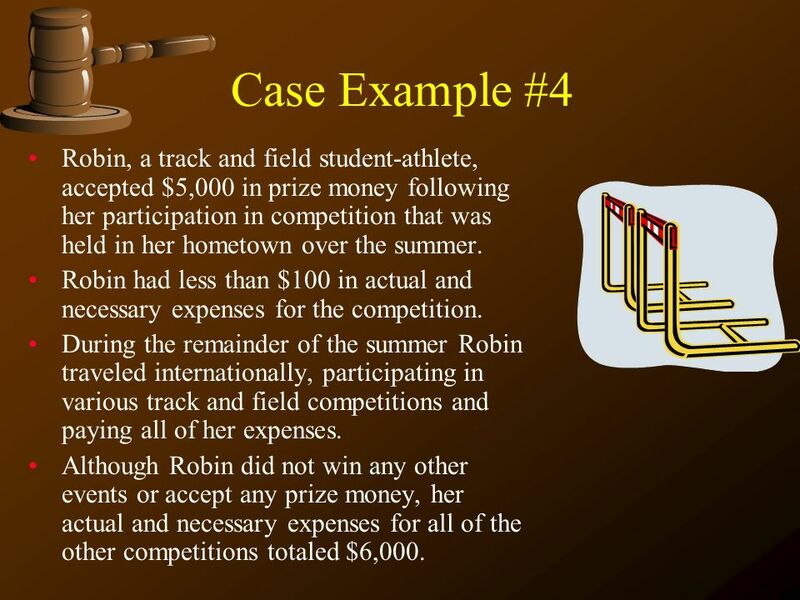 45 Case Example #4 Robin, a track and field student-athlete, accepted $5,000 in prize money following her participation in competition that was held in her hometown over the summer. Robin had less than $100 in actual and necessary expenses for the competition. During the remainder of the summer Robin traveled internationally, participating in various track and field competitions and paying all of her expenses. Although Robin did not win any other events or accept any prize money, her actual and necessary expenses for all of the other competitions totaled $6,000. 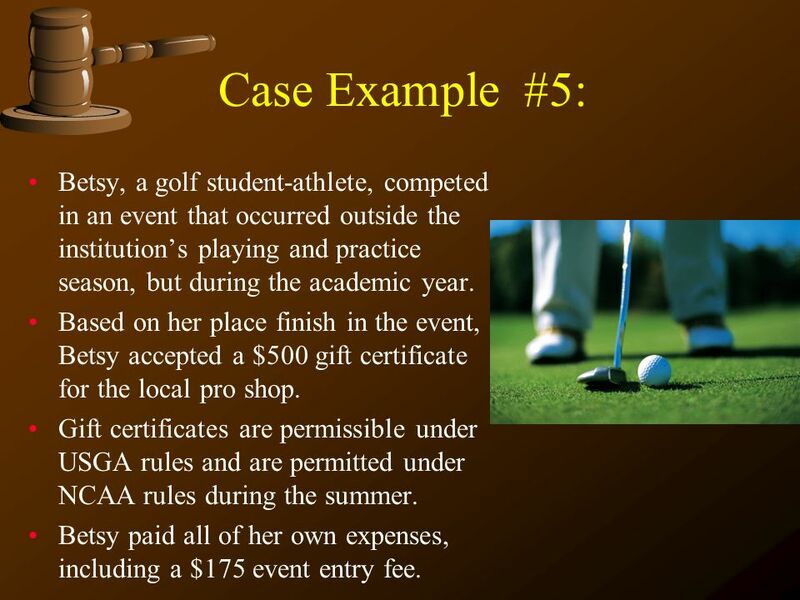 46 Case Example #5: Betsy, a golf student-athlete, competed in an event that occurred outside the institution’s playing and practice season, but during the academic year. Based on her place finish in the event, Betsy accepted a $500 gift certificate for the local pro shop. Gift certificates are permissible under USGA rules and are permitted under NCAA rules during the summer. Betsy paid all of her own expenses, including a $175 event entry fee. 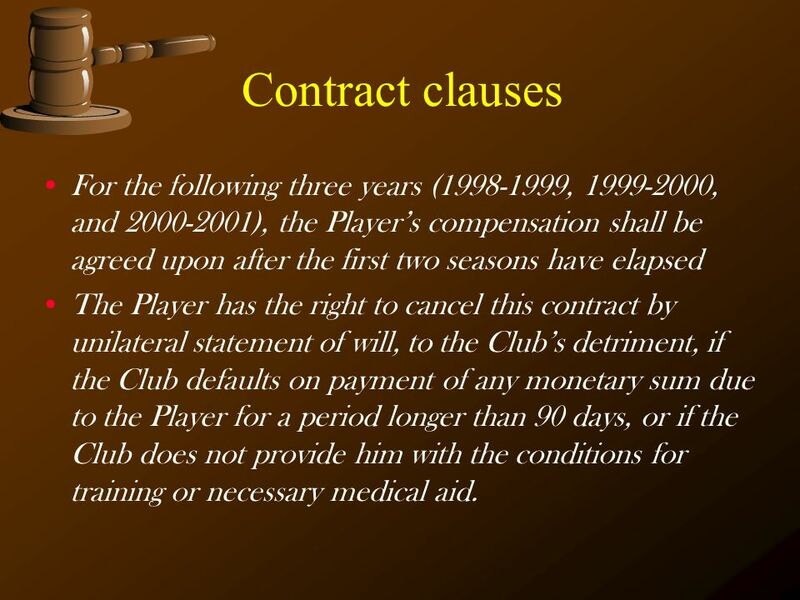 54 Contract clauses For the following three years ( , , and ), the Player’s compensation shall be agreed upon after the first two seasons have elapsed The Player has the right to cancel this contract by unilateral statement of will, to the Club’s detriment, if the Club defaults on payment of any monetary sum due to the Player for a period longer than 90 days, or if the Club does not provide him with the conditions for training or necessary medical aid. 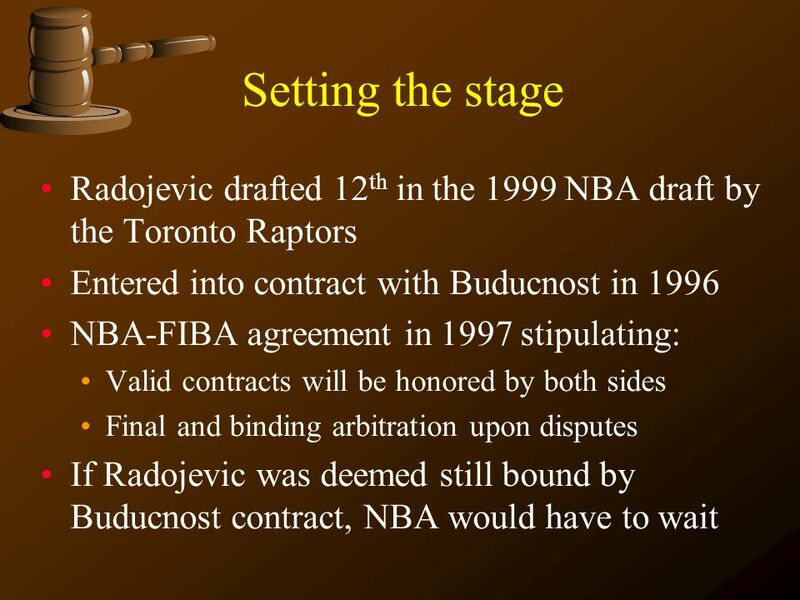 Whether the contract between Radojevic and Buducnost was a valid and binding Player Contract as defined in the NBA-FIBA agreement, thus a written agreement which requires the performance of services as a basketball player for a specified term and for a specified salary or other compensation. 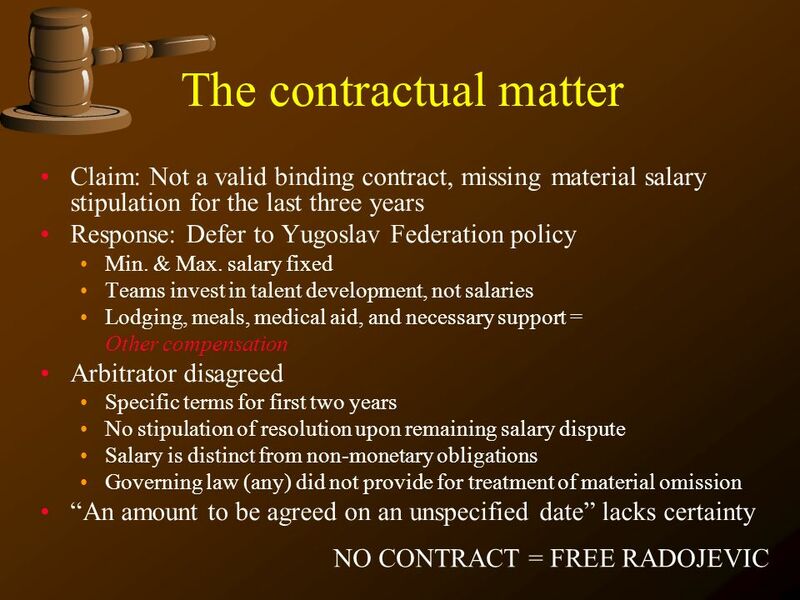 Whether or not Buducnost was in breach of the obligations owed by it to Radojevic by failing to pay amounts required under the contract and, if it was in breach, whether Radojevic was entitled to, and did, treat that breach as a repudiatory breach of that contract. 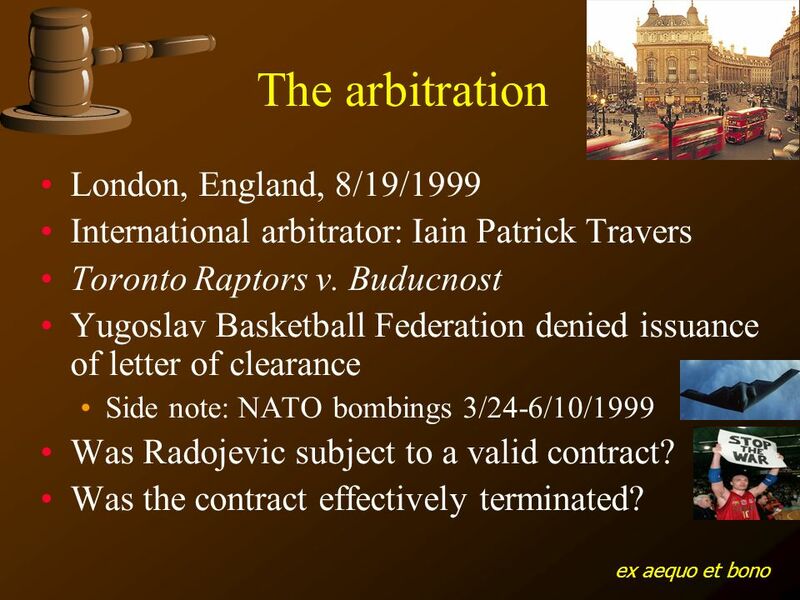 Whether or not Buducnost failed to provide the medical aid that it was obliged to provide to Radojevic under that contract and, if it did so fail, whether Radojevic was entitled to, and did, elect to treat that breach as a repudiatory breach of that contract (In re: Toronto Raptors v Buducnost, pp. 7-8, § 14). 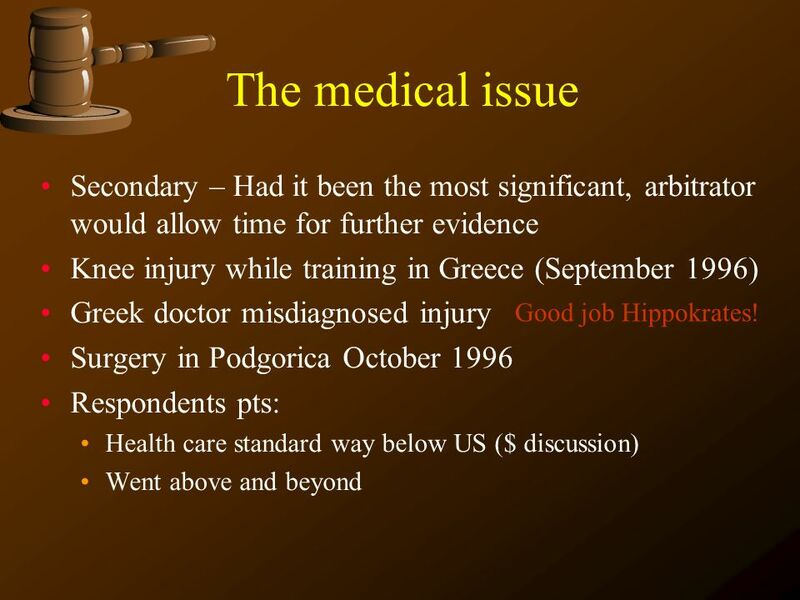 56 The medical issue Secondary – Had it been the most significant, arbitrator would allow time for further evidence Knee injury while training in Greece (September 1996) Greek doctor misdiagnosed injury Surgery in Podgorica October 1996 Respondents pts: Health care standard way below US ($ discussion) Went above and beyond Good job Hippokrates! 58 What if this occurred today? 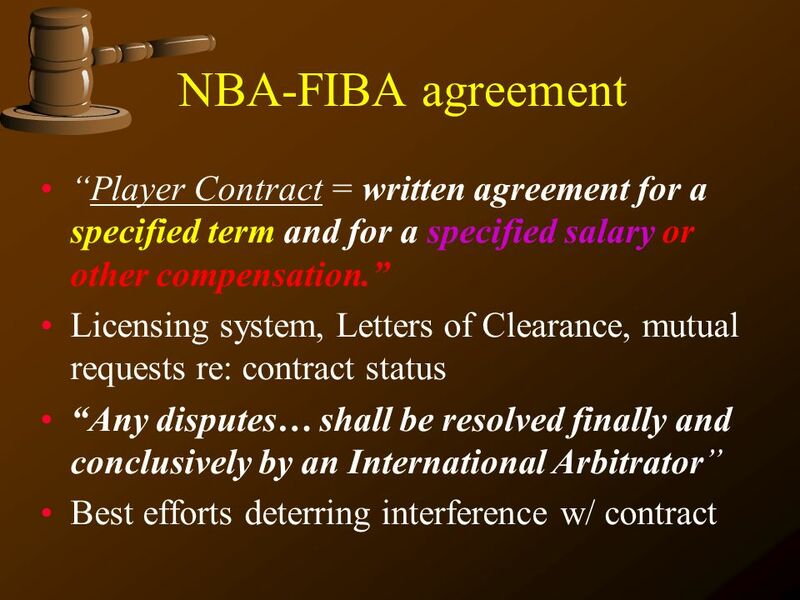 New FIBA ADR–FIBA Arbitral Tribunal (FAT) New contracts + FAT arbitration clause Court of Arbitration for Sport (CAS) Appeals (+waiver of Swiss Federal Tribunal appeal) Could CAS contribute to NBA-FIBA disputes? 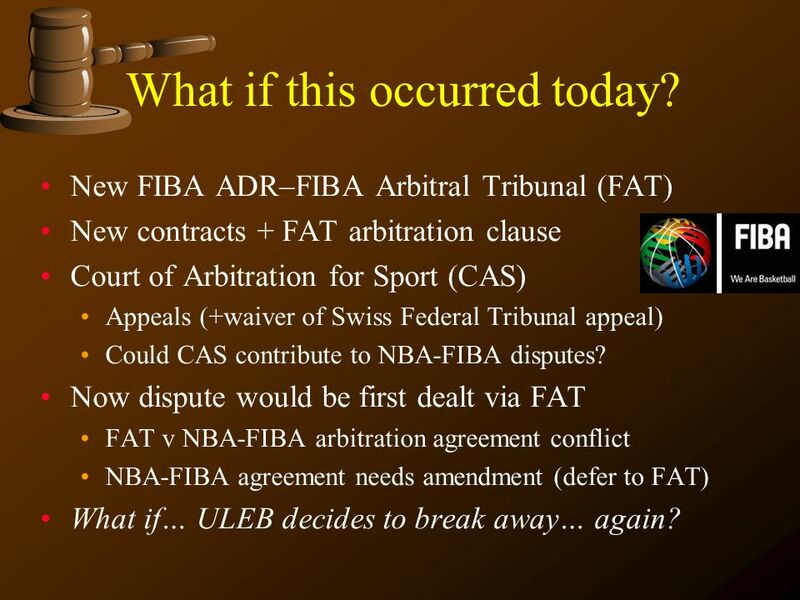 Now dispute would be first dealt via FAT FAT v NBA-FIBA arbitration agreement conflict NBA-FIBA agreement needs amendment (defer to FAT) What if… ULEB decides to break away… again? 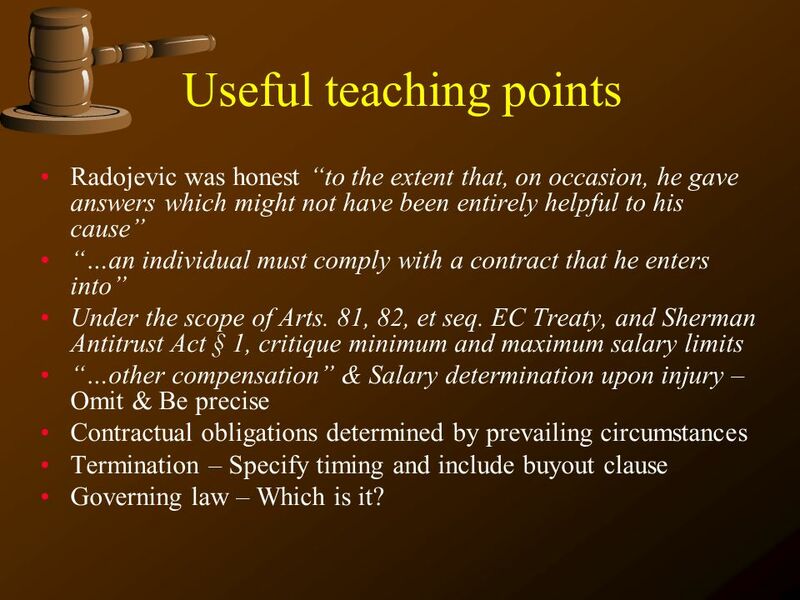 Radojevic was honest “to the extent that, on occasion, he gave answers which might not have been entirely helpful to his cause” “…an individual must comply with a contract that he enters into” Under the scope of Arts. 81, 82, et seq. 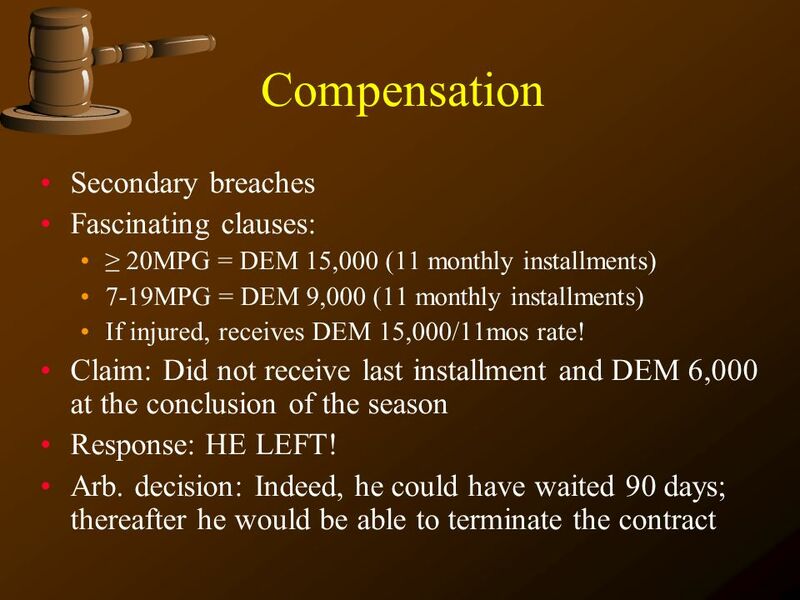 EC Treaty, and Sherman Antitrust Act § 1, critique minimum and maximum salary limits “…other compensation” & Salary determination upon injury –Omit & Be precise Contractual obligations determined by prevailing circumstances Termination – Specify timing and include buyout clause Governing law – Which is it? 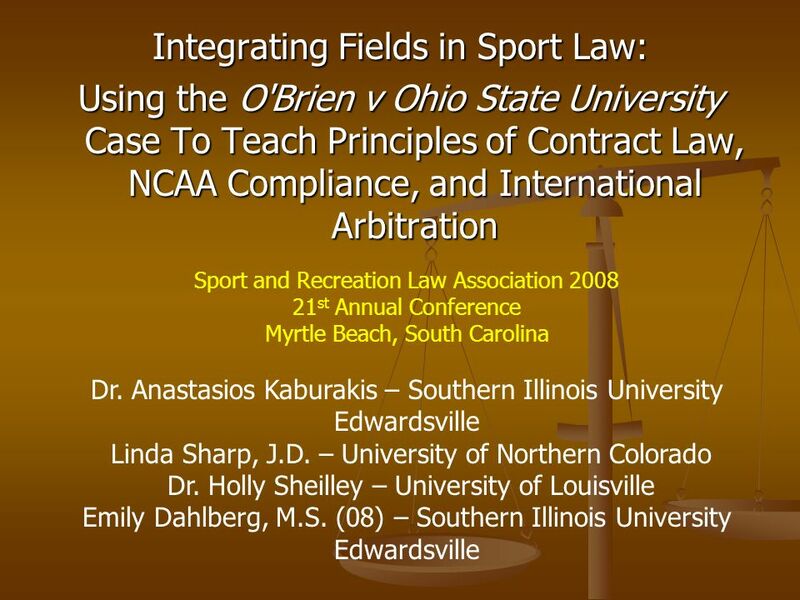 Download ppt "Integrating Fields in Sport Law: Using the O'Brien v Ohio State University Case To Teach Principles of Contract Law, NCAA Compliance, and International." Villanova University Compliance. Agenda Review Legislation. 3/13/2012 Division I - Transfers. Transfer Student A transfer student, in the application of NCAA eligibility requirements, is a student who transfers. 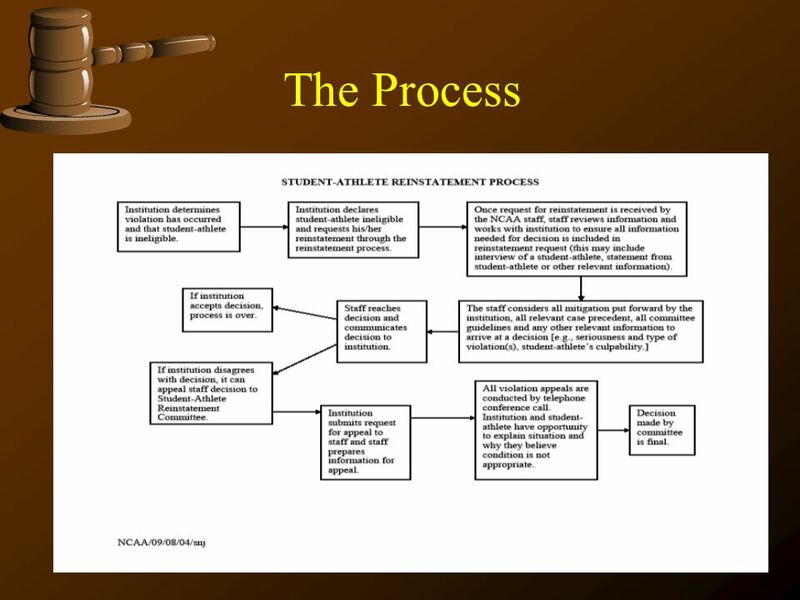 2010 NCAA Regional Rules Seminars Division I Pre-Enrollment Amateurism Certification Process and Student-Athlete Reinstatement (presented in two separate. 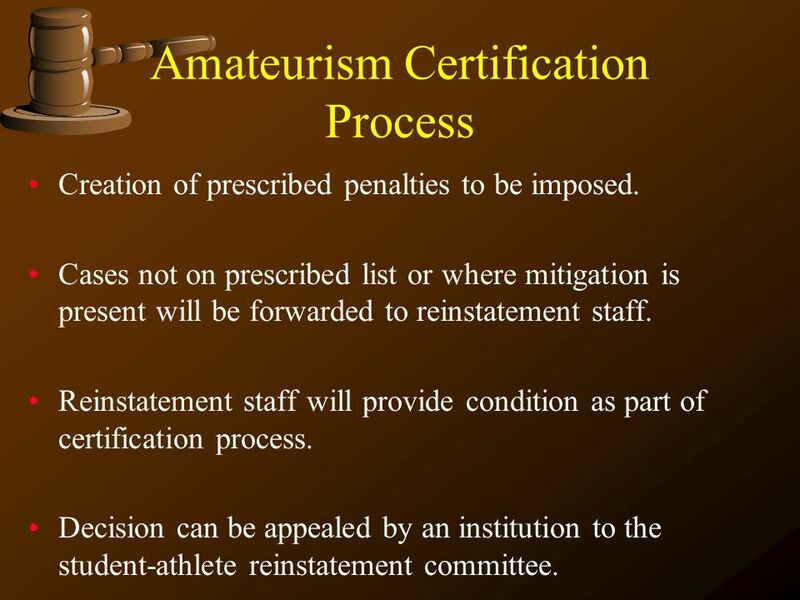 NCAA Bylaw 14 ( Eligibility) Concepts. Concept No. 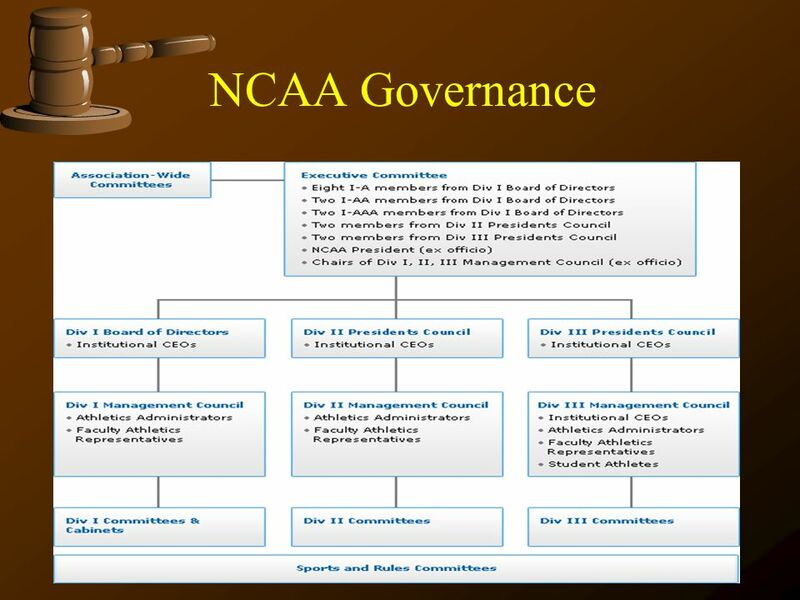 1: Create an academic success operating bylaw that focuses specifically on student- athlete and team. Division II Transfers Division II Transfers - Checklist. Seasons of Competition and The Five-Year Clock Bylaw 14.2 Virginia Tech Athletics Compliance September 2010. In football, when is it permissible for the head coach to make a telephone call to a PSA who is in his junior year in high school? April 15 through May. Chapter 5 Contract Law. Contracts Coaching contracts Player contracts Endorsement agreements Scholarships and letters of intent Concession agreements. Steve ClarCharnele Kemper. Sports sponsorship. Contests versus dates of competition. 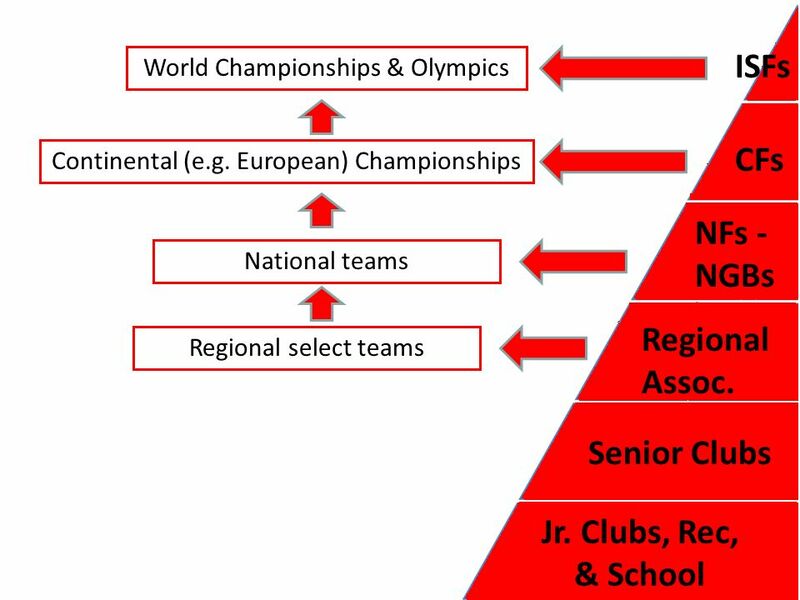 Multiteam events in individual sports. Scheduling requirements. Sports. Athletic Directors Workshop New Athletic Directors Workshop CIAC Athletic Directors Workshop Part II CAAD Conference March 2008. NCAA Basketball Keeping it Real…. Its Your World!!! 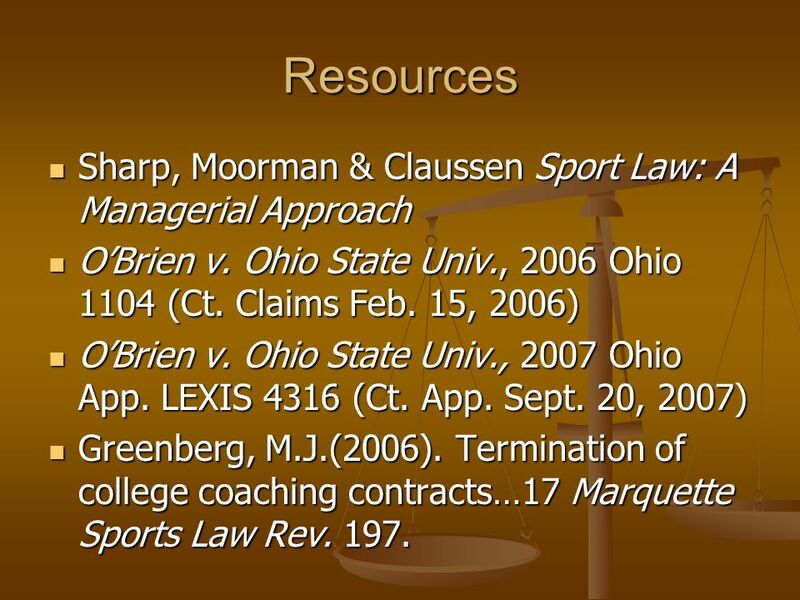 By-Law 17 NCAA proposed by-law changes Dr. Bren Stevens. 1 Monthly Rules Education Session January 2012 Transfer Eligibility. Use Mobile Guidebook to Evaluate this Session NCAA Division I Academic Standards and Legislative Update SACRAO Transfer Conference February 18, 2014. NCAA Eligibility Center.  NCAA Eligibility Center Responsibilities.  Academic Initial-Eligibility Requirements. 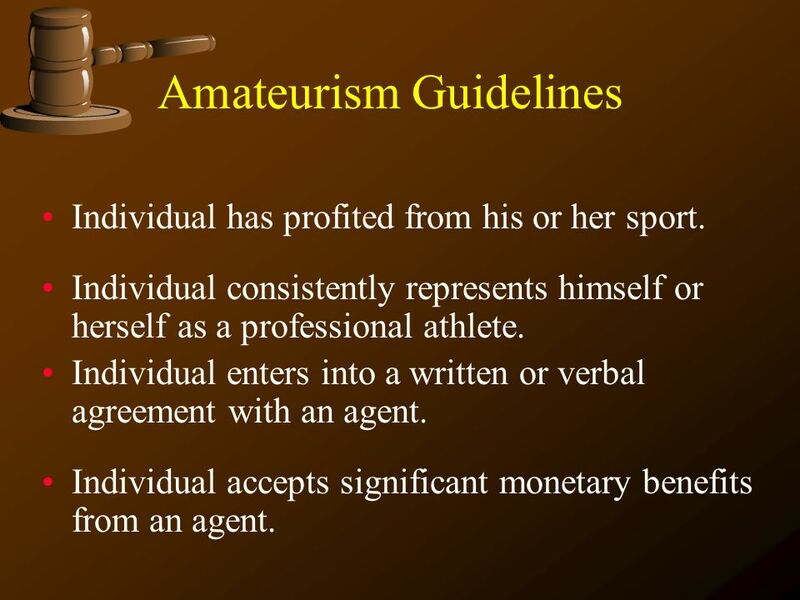  Amateurism (Sports Participation).